"Shoot... what did he say again? I just got disconnected." "Didn't that guy already loot that rare item 10 minutes ago?" "I really wish I could remember the name of the item linked on the guild chat yesterday at 9:00 PM." Already been in one of these situations? Don't be annoyed anymore, here is the solution! Elephant logs the chat for you in the background even when you get disconnected. It saves the WHISPER & BATTLE.NET, RAID, INSTANCE & BATTLEGROUND, PARTY, GUILD, SAY, YELL and OFFICER chats separately, but also all general chats (General, Trade, LocalDefense, ...), custom chats you are currently on, achievements, loots and finally system messages (auctions, rolls, server going down, ...). You can easily go through all these logs, thanks to a straightforward interface displaying all the access buttons on the right side of the main window. You can access the options of the addon by typing /elephant and also bind a key to pop up the addon. Elephant gives you the ability to copy up to 100,000 (yes, 100k) characers of logs to another application. A BBCode feature is even included, letting you copy/paste a chat with colors and links to an item database in a very quick and simple way to your favorite forum. This is THE addon that you should install if you want to never forget what somebody told you in game. Be a pro of managing hell tells, go peacefully AFK for a few minutes, or be an awesome role player. Elephant is also perfectly designed for Guild Leaders, Officers and Raid Leaders particularly because it restores the chats after you've been disconnected. Logs the chats in the background, with a limit of 10,000 lines for each chat (Blizzard's default is 161 lines for everything). Saves the logs when you log out or get disconnected. Display the chats with timestamps, or using your Prat settings if you have it installed. Copy the chat and paste it in other applications (BBCode supported! ), up to 100,000 characters. Save the chat and combat log in two different files on your computer (using the default Blizzard logging system). Use filters to avoid logging some of the custom channels you join. Enable/disable logging for each chat separately. Item links in logs are displayed in their proper color and are clickable. Player names in the main window are clickable. has the project been abandoned ? if so, can someone please name an addon that acts similarly ? So I am trying to use this to replace wowscribe it's really cool! but it's logging so much crap even though I tell it to stop logging trade, xetention tool tip extra it still logs it and on top of that if anyone creates anything, gets an achievement, my friends log on, off.... it logs all of that too and then some. Which is fine if people want all that but I don't. So is there any way you can make the copy window copy all thousand lines at once so I don't get the garbage that ends up in the WoWChatLog? Or maybe tell me how to filter this stuff out of that log? I do have them disabled from the elephant interface and logging new channels turned off. Well except for the creation stuff cause I can't find that log in the interface to try. Please pretty pretty please. I only want to log says yells emotes party guild whispers officer how do I get it down to that? Messages not logged when Prat formatting is enabled should be back. 3.0.6-beta is out, with a brand new option: class colors in logs if you're not using Prat! And a few other enhancements. In order to log achievements that happen around you, go on the achievement log and then select "Achievements" from the message catchers at the top right of the main window. By default it is deactivated because it creates a duplicate if soomeone in the guild gets an achievement and you are near him/her. and is it possible make the enable/disable switch into elephant configuration in ace3? New options display, much more straightforward! 3.0.4-beta is out! This version should be much more stable, have quite a few optimizations and enhancements in the interface, and offer a brand new way to configure the addon. Good testing! I'm looking for some people to update the locales of the addon. If you are one of those, don't hesitate to commit the modifications directly on Wowace! Addon still does not have a minimap icon, working on this (should be available pretty soon). May the God of Addons shower you with gifts and rose petals! Thanks so much for your work on this addon. 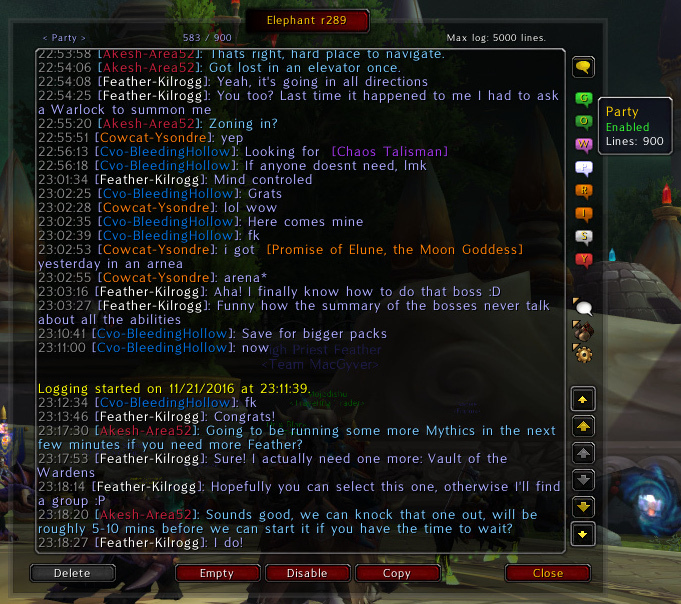 It has been extremely valuable when having to deal with many Guildies asking questions all the time. A perfect Secretary. So far it is working very well with only a few bugs that I am sure you are working on. Thanks for your time. I love the addons. 3.0.1-alpha is out, check it out if you do not fear having some errors from time to time! Note: links in the chat window are still not clickable. Im sure what ever you do will be great. Thanks for your time. Yeah, I'm currently working on it and just released an alpha (3.0.0-alpha). It is however very unstable, so I recommend that you wait until I put it in Beta before trying it. By the way, don't expect the release to be able to read your old Elephant data: it won't work, since the way of storing data from has changed from Ace2 to Ace3, unfortunately. I've just loaded Elephant r131 and am getting an LUA error every time a new line comes in on trade channel. I disabled the mod before I got any chat from any other channel because it was so damn annoying. This has been my most important addon. Thanks for making this great tool and would love to have it working again.